Diets set us up to fail. Try this instead. Did you make a New Year’s Resolution to lose weight? If so, you’re not alone! It’s the #1 resolution – it’s estimated that 1 in 3 people resolve to shed at least few pounds. It’s no surprise, then, that sales of diet books, pills and other “quick-fix” products skyrocket this time of year. If you’re trying to choose a diet, I’ve got bad news for you. You may already have set yourself up for failure. Media messages confuse dieters. Stop eating fat if you want to be skinny! If only we’d cut out carbs, weight would fall right off – bread is the enemy. No, instead go raw to lose weight. Oops, I meant go Paleo. Um, Keto is definitely the way to go. Wait, what’s your blood-type? How about testing your urine for its pH and alkalizing your body? Here’s the science – no matter the diet, creating a calorie deficit is the only way to guarantee weight loss. Many dieters experience high levels of body dissatisfaction and poor self-esteem. Reported diet failure becomes a negative predictor for weight-loss success. The goal of health improvement does not motivate people to lose weight. Achieving change in appearance is the principal motivation for many dieters. So even a healthy change in blood pressure doesn’t keep someone encouraged to continue on their path unless they’re fitting into smaller jeans, too. Dieters tend to return to their previous eating habits. Regardless of whether a diet is successful or not, regression is common, suggesting that many people view diets as a phase, not a lifestyle change. And why would they? I don’t want to give up my favorite foods for the rest of my life, either! Many dieters struggle with food cravings. Due to the restrictive nature of most diets, people will crave and then hyper-focus on the perceived “bad” foods, until their will-power gives out. A binge cycle starts, they throw up their hands and give up on the whole thing. Some dieters experience changes in self-perception. A single deviation from the diet leads people down a negative self-talk path (“I have no willpower”, “I’m weak”). They’re basing their self-worth on their dietary success, which can contribute to low self-esteem. So if we know that diets are highly likely to fail, how should we approach weight loss? Back in 2009, a terrific study was done on what we’ll call the “Small Changes Approach.” The concept is that small changes to both your nutritional lifestyle and physical activity level are easier to implement and maintain than many “diets.” Why? 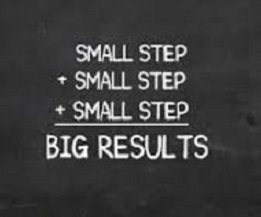 Small changes are more realistic the achieve and maintain than large ones. Years of research and observation back this up, and your personal experience probably tells you this is true, too. Even small changes influence body weight, both positively and negatively. I know we all want a quick fix, but if it took a few years to add 10-20 pounds to your frame, why do you think you can take it off in a month or two and keep it off? Small, successful lifestyle changes improve self-efficacy. The sense of “I can do this” leads to improved confidence and willingness to make further small changes, leading to greater weight-loss progress. The small changes approach can be applied to environmental forces. Businesses have gotten really savvy at creating environmental cues that encourage excessive food intake. The small-changes approach counteracts those cues. The NEAT approach means more moving, less dieting. Nonexercise Activity Thermogenesis (NEAT) is a new line of research investigating the role of standing, walking, and non-planned physical activity in combatting weight gain. With all this info at hand, over the next 5 weeks I’m going to share with you small ways in which you can slowly and steadily make changes to both the way you eat, and how much movement you get in your daily life away from the gym. Let’s make 2018 a year of successes!